Thread: How do you attach hanging loops/sleeve to quilt once it is bound? I have a smaller quilt here (maybe 45 by 35 inches) that I would like to hang on the wall. 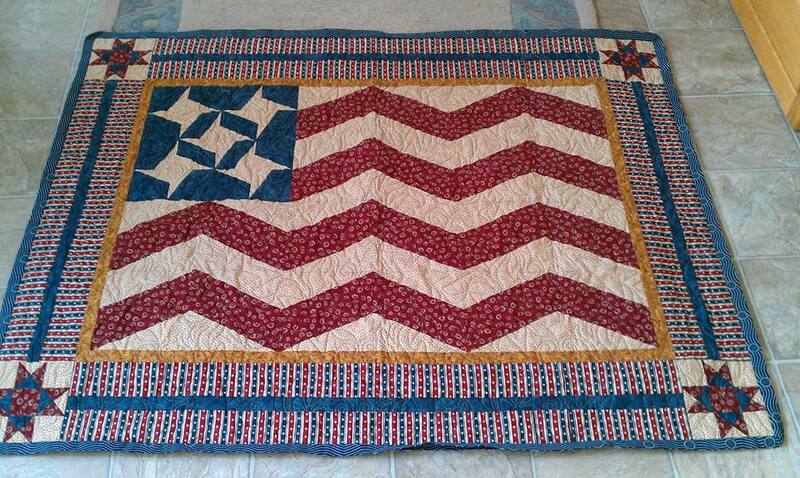 It is a flag quilt so I do not want to use quilt hangers. That is how I usually hang up my wall quilts. Is there a way to attach a hanging sleeve/ fabric hoops etc to a quilt once it is bound? Should I use round wooden rings and sew them to the back? Would the quilt backing not rip from the weight of the quilt? Great quilt! I will be following this thread. I sew hanging sleeves on most of my quilts after I sew the binding down. The sleeves are tubes about 6 inches wide x 2 inches shorter than the quilt. I place the top of the tube about 1 inch down from the top of the quilt, whip stitch it, then sew the bottom. I have two quilts that have hung in my office for over 10 years - the backing hasn't ripped yet, and the quilts are queen size. then i hand sew the bottom of the sleeve to the back. I prefer having the sleeve in the binding and machine stitch to the quilt but your is lighter and will probably be ok if you carefully stitch it down with lots of small stitches on both sides of the sleeve. I have had to do this sometimes when I hadn't expected to enter the quilt in a quilt show. I do it the same as Janet (Hinterland). In the past I've sewn the top edge into the binding, but have discovered that if you do this, the hanging sleeve will be visible from the front. So I drop it down a couple of inches. QuiltnNan has a great idea with the SID. Glad to know there is a way to do by machine. The last one I did, I did it all by hand. It is hanging pretty nicely in son and daughter in law's foyer. Next time I will do it by machine. I cut mine 9 inches, fold and stitch a tube. finish ends too. then I always hand stitch just under the binding, then take the tube/sleeve and fold up to just under the top edge of the quilt and flatten out the sleeve and pin the bottom where it lays and hand stitch that down. the "extra" you got from the little folding will help the hanger you insert not pull on the quilt. all should hand well. I think I remembered to machine stitch the sleeve on one quilt. I always think of it too late. The one I have done, I made the hanging loops like for tab top drapes then I machine stitched the folded seam edge right below the binding - sort of stitch in the ditch. It was sort of bulky and the next time I just did it at the same time as attaching the binding.